Clinical presentation An elderly female patient was admitted to intensive care for prolonged vasopressor therapy and mechanical ventilation after cardiac arrest and acute percutaneous coronary intervention. Antiplatelet, thyroid hormone replacement and statin therapies were administered through a 14-French nasogastric tube (Nestlé Health Science) and enteral feeding was initiated. Correct position of the nasogastric tube was confirmed radiologically. On the seventh day in the intensive care, our patient was seen to regurgitate soft crumbs into her mouth. The blocked nasogastric tube was removed, but attempts to reinsert another tube failed. 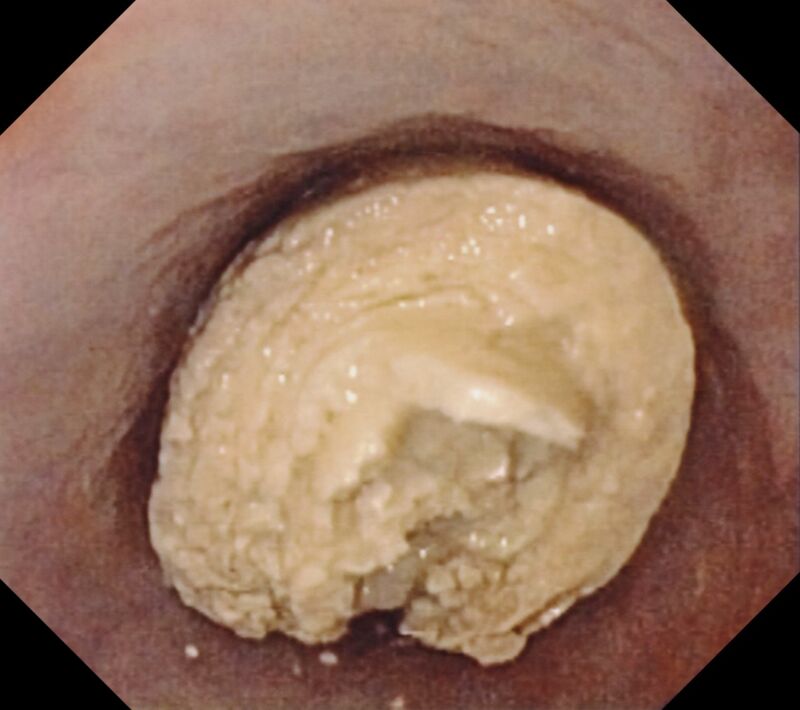 Upper GI endoscopy revealed an obstruction of the oesophagus with a milky-yellowish caseous substance 20 cm from the incisors (figure 1). The proximal part of the mass showed a central hole and ring-shaped layers resembling the cut face of a tree trunk. Obstruction of the oesophagus with a milky-yellowish caseous substance. Questions What caused the obstruction? How should we manage such a problem? Contributors FR, GP, LPB, PF and JP: design, acquisition of data and drafting of manuscript.